This article is about the hereditary title. For the current Baron, see Rupert Carington, 7th Baron Carrington. For the unrelated life peer, see Matthew Carrington, Baron Carrington of Fulham. The second creation came in 1796 when Robert Smith was created Baron Carrington, of Bulcot Lodge, in the Peerage of Ireland. He had earlier represented Nottingham in the House of Commons. Only one year later, in 1797, he was made Baron Carrington, of Upton in the County of Nottingham, in the Peerage of Great Britain. His son, the second Baron, sat as a Member of Parliament for Wendover, Buckinghamshire and High Wycombe, and served as Lord Lieutenant of Buckinghamshire. In 1839, the year after the death of his father, he changed his name to Carrington (with double-r) by Royal Licence. In 1880 he owned 25,809 acres (104.45 km2) of land in Buckinghamshire, Lincolnshire and Bedfordshire, giving an annual rental income of £42,254. His son, the third Baron, was a prominent Liberal politician. He and his brothers changed their name to Carington (with a single r) in 1880. 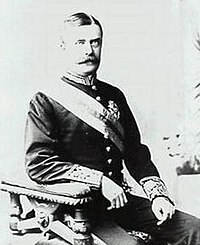 He was created Viscount Wendover, of Chepping Wycombe in the County of Buckingham, and Earl Carrington, in 1895. The following year he changed his name to Wynn-Carington by Royal Licence. He was created Marquess of Lincolnshire in 1912. These three titles were all in the Peerage of the United Kingdom. Under King George V, Lord Lincolnshire held also the Lord Great Chamberlainship, one-quarter of which he had inherited from his mother. His only son and heir, Albert Edward Samuel Charles Robert Wynn-Carington, Viscount Wendover, was killed in action in World War I. Consequently, on Lord Lincolnshire's death in 1928, the viscountcy, earldom and marquessate became extinct. His share of the Lord Great Chamberlainship was inherited by his five daughters as co-heiresses (one-twentieth each). The 1796 and 1797 baronies passed to the Marquess of Lincolnshire's younger brother, the fourth Baron. He had earlier represented Buckinghamshire in Parliament as a Liberal. His grandson the sixth Baron, who succeeded his father in 1938, was a noted Conservative politician who served as Foreign Secretary from 1979 to 1982 and as Secretary General of NATO between 1984 and 1988. In 1999 he was given a life peerage as Baron Carington of Upton (spelled with a single r), of Upton in the County of Nottinghamshire, and thus continued as a member of the House of Lords after the passing of the House of Lords Act 1999 had removed the automatic right of hereditary peers to be members. At the time of his death in 2018 he was the longest-serving member of the House of Lords, having taken his seat in 1945, and also the oldest member. As of 2018, the baronies are held by his son Rupert Carington, 7th Baron Carrington. The Hon. Sir William Carington, second son of the second Baron, was a soldier, politician and courtier. The Barons Carrington are related to the Barons Bicester. The first Baron Carrington's younger brother John Smith was the great-grandfather of Vivian Smith, who was created Baron Bicester in 1938. Also, Abel Smith, MP, father of the first Baron Carrington, was the brother of George Smith, who was created a baronet in 1757 (see Bromley baronets), and of John Smith, great-grandfather of the first and last Baron Pauncefote. The family seat is The Manor House, near Bledlow, Buckinghamshire. Rupert Francis John Carington, 7th Baron Carrington (born 1948). The heir apparent is the present holder's son, the Hon. Robert Carington (born 1990). Male-line family tree, Barons Carrington. An elephant's head, crased, Or, eared Gules, charged on the neck with three fleurs-de-lis, two and one, Azure. Or a chevron cotised, between three demi-griffins couped those in chief respectant Sable. On either side a griffin Sable, winged, beaked, and membered Or, the dexter charged on the body with three Fleur-de-lis and the sinister with three trefoils Or. The Order of the Garter circlet (for 6th Baron Carrington). ^ Cokayne, and others, The Complete Peerage, volume II, page 197. ^ John Bateman: The Great Landowners of Great Britain and Ireland. ^ a b Mosley, Charles, editor. Burke's Peerage, Baronetage & Knightage, 107th edition, 3 volumes. Wilmington, Delaware, U.S.A.: Burke's Peerage (Genealogical Books) Ltd, 2003. ^ "Viscount Wendover Dead". The Register. Adelaide, South Australia. 21 May 1915. p. 6. Retrieved 2 May 2012. ^ Burke, John. A General and Heraldic Dictionary of the Peerage and Baronetage... London: H. Colburn and R. Bentley, 1832. Volume 1, p. 217. Retrieved 19 December 2013. This page was last edited on 3 April 2019, at 20:46 (UTC).